Has mortgage advances growth peaked? According to data released by the South African Reserve Bank, mortgage advances by the monetary sector increased by 29,6% year-on-year in September 2006 (30,3% in August), bringing the total amount of mortgage advances in the monetary sector to R640,4 billion. On 12 October, the Reserve Banks Monetary Policy Committee (MPC) increased the key policy interest rate, the repo rate, by 50 basis points to 8,5%. Commercial banks followed shortly afterwards with increases of the same magnitude in their lending rates to the public. 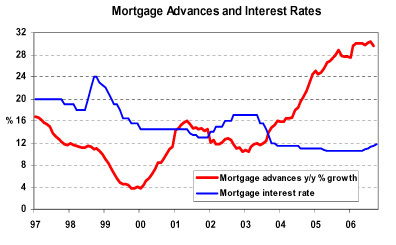 Prime overdraft and variable mortgage interest rates are currently at a level of 12%. The MPC stated that inflationary pressures in the economy are caused by volatile international oil prices, rising food prices and a significantly weaker rand exchange rate, prompting them to hike rates for the third time since June this year. Record-high levels of household debt as a result of continued strong credit extension, as well as the deficit on the current account of the balance of payments also remained a concern to the MPC. In view of these developments, as well as expectations of CPIX inflation increasing to above 6% in late-2006/early 2007, interest rates are forecast to rise by a further 50 basis points at each of the December 2006, February and April 2007 MPC meetings, bringing prime and variable mortgage interest rates to a level of 13,5% by April next year. Mortgage advances growth, which remained at a level of around 30% year-on-year since March this year, is projected to slow down to about 24% by the end of the year (28,6% at the end of 2005), and about 14% by the end of 2007, taking into account that interest rates are expected to continue increasing into the first half of next year.